What is in it for the CEO, business leader or hiring manager? – Filtering out the wrong candidates and developing candidates for the role and for the business through a deliberate, systematic, proven, disciplined process. – An improved clarity and refined definition of the business needs, resulting in a superior candidate fit due to the execution of the process approach. – A faster start and substantial outcomes from the newly hired talent. – Increased profit from the outstanding performance driven by hiring new employees who exceed the technical requirements and also fit well within the business’s culture. – Integrity with a business relationship established with a common goal. – Straightforward business model. No surprises. No hidden fees. Fixed fee, flat fee. – A partner in the business building process. – An outcome focused on the newly hired talent solving the business problem on day 1 of their new job. – The focus to hire technically qualified talent who is regarded by our client as the best cultural fit for their business. It takes time to get the right chemistry, and it is worth the time to hire the right talent. – The Boxwood process oriented approach: Highly interactive with qualified candidates, for the purpose of having the talent show their value (not just tell why they should be hired). 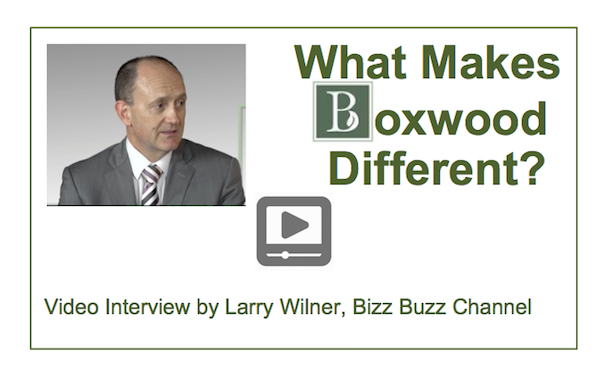 At Boxwood, we think it’s time for a change when hiring critical talent for your business. Our approach starts with a different business philosophy and different recruiting philosophy. In many instances, traditional recruiting/headhunting fees are commission-based. The higher the compensation package for the employee, the more the recruiter is paid. Therefore, the traditional headhunter is incented to “encourage” the employer to hire the highest paid candidate. It is our experience that the “right talent” (experience, expertise, cultural “fit”) for your business is not necessarily the highest paid candidate. At Boxwood, to attract and recruit the “right talent” for your business, we should simply be focusing to find the best talent and the right “fit” for your company. A critical part of the recruiting process involves trust. Our client, the CEO, business leader or hiring manager needs a trusted partner managing the recruiting process when interacting with complex and complicated members of the human race. Just as importantly, for our client to acquire the best talent, we need to also earn the trust of the talent. When the talent feels comfortable, they are more likely to interact during the interviews as they would interact as a member of your organization. …and isn’t that what you would like to see from qualified candidates? Not searching internet keywords or short cut decision-making criteria; but a 360 degree view of candidates who are ready to join your team. With the traditional headhunting model, does the hiring manager really trust the headhunter recruiter who is resume surfing to submit highly paid candidates when it clearly equates to a bigger payday for the recruiter? Does the talent trust the headhunting recruiter when there is an obvious push to get them into the interview process with an ulterior, commission focused motive? Many executive leaders don’t realize how many highly qualified candidates are turned-off by short term, commission-focused headhunters. Boxwood’s focus is to serve in a consultative role to our client, the CEO, business leader or hiring manager. – The alignment of the business for the optimization of performance. – A compensation model that defines individual responsibilities, establishes specific, short-term goals that are integrated with the company’s direction and then rewards for performance. – A communication or marketing aspect that promotes the positive news of business growth and related need to acquire critical talent. – Internal evaluation and reflection for the business to determine what business problem needs to be solved by the acquisition of critical talent. The Boxwood business approach is to determine the need of our client and then to reach a fixed fee/flat fee agreement. We complete the fee discussion early in our engagement. Going forward, we have the business foundation for a trusted client relationship while all of our time is devoted to the execution of hiring the best talent (without any fee related distractions).